When you’re busy shopping, sometimes you need a quick fix to keep you fuelled. Tastier – and much classier – than your average shopping mall fast food, here are the top 5 London restaurants inside shops. Serving up authentic Tokyo-style ramen (made with in-house crafted noodles) alongside a range of London and Japanese beers, Tonkotsu in Selfridge’s Food Hall is the perfect place to stop and refuel as you shop. Try the chilli chicken ramen with edamame beans, pickled cucumber and gyoza, or the Tonkotsu ramen with pork belly and stock broth. For vegetarians, there is a delicious Shiitake-based miso. With just 14 seats around the central bar and kitchen though, be prepared to squash in for your noodle fix. It’s worth it. 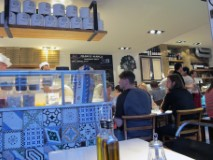 Franco Manca has gained a cult following across London for its wondrously slow-rising sourdough pizza bases, baked in a wood-burning ‘Tufae’ brick oven. The Gloucester Old Spot ham, mozzarella, buffalo ricotta and wild mushroom topping is the perfect contrast. Try with a glass of the organic Ottario Rube Rosso – bellissimo. (The Westfield mall restaurant has a slightly different menu to other outlets). 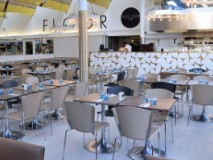 When it comes to fine dining, Harvey Nics is the restaurant inside a department store. If you’re still feeling the post-festive pinch, the excellent Winter Feasts menu includes a cocktail on arrival and a three course meal for just £30 (until 8 February). Dishes include an on-trend Mackerel ceviche, endive, salsify salad and hazelnut dressing starter, and for dessert, a caramel, banana and coconut panna cotta with piña colada ice cream. Suddenly, summer feels closer than you’d think. 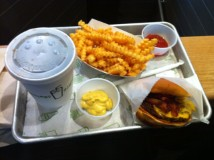 This east coast USA import has taken Covent Garden shoppers in need of high quality fast food by storm. Place your order and relax in the historic Market Building – the buzzer will let you know when your burger is done. Informal, fast food dining at its best. If you’ve still got room after the double SmokeShack cheeseburger, topped with all-natural Applewood smoked bacon, chopped cherry pepper and ShackSauce, try one of their frozen custards – flavours rotate on a weekly basis. If it’s “salted buttery caramel frozen custard week”, then well done – you’ve hit the jackpot. Born as a pop-up in 2012, Warren Dean and Daniel Fiteni have created simple fast food with a twist at Brixton Village Market. 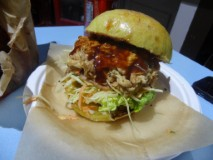 The twist is 16-hour slow cooked pulled pork with Asian-style spring onion, ginger, chilli, slaw and salad, served in a brioche bun and wrapped in greaseproof paper to hold the spicy juices. Forget shopping in the nearby vintage and craft shops within the market, The Joint is a London destination in itself.